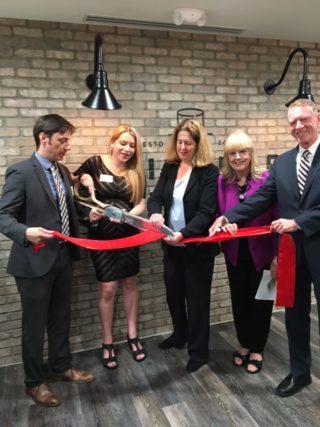 NatCapLyme attended and presented at the inaugural ribbon cutting ceremony of the opening of the Smile Bar Dentistry Clinic welcoming the business to the city of Alexandria. Along with Dr. Vitalia Genieva, D.D.S., was the Mayor of Alexandria, Allison Silberberg, and members of the City of Alexandria Chamber of Commerce, including Joe Haggerty, President and CEO, and Monte Skall, the Executive Director of NatCapLyme. Pictured from left to right are Eddie Bitzer, Dr. Vitaliya Genieva, Allison Silberberg, Monte Skall, and Joe Haggerty. According to Dr. Genieva, a couple years ago, she had to learn about chronic Lyme disease firsthand. One of her closest family members fell ill to a mysterious illness. Here is what Dr. Genieva had to say about her family’s experience. “Being sick is terrible, but not knowing what’s making you ill is even worse. After finally receiving the diagnosis “Chronic Lyme Disease” we began the nightmare of trying to treat it. We were like most people, we didn’t know much about Lyme Disease. But we’ve learned. Most people know it’s transmitted by certain species of ticks, what they didn’t know is there are several of those species right here in our area. There’s no clear treatment when it isn’t caught early, little conclusive research, and millions of misdiagnosed suffering patients. According to the CDC, it affects 6 times more people than HIV/AIDS yet receives less than 1% of funding and is nearly twice as common as breast cancer. We’re helping to change this by partnering with NatCapLyme, a local organization that’s working to change regulations, advance research and help people find effective treatment. We are committed to raising awareness in our community. We are also donating a portion of every new patient treatment to NatCapLyme.” To read more about the event, please visit Smile Bar Dentistry’s website at: http://www.smilebardentistry.com/community-first/.